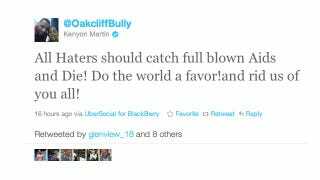 Kenyon Martin Would Like All Of His Haters To "Catch Full Blown AIDS And Die!" A veteran of 11 NBA seasons, Kenyon Martin has no doubt encountered a hater or two in his travels throughout the league. One might thus assume he's conditioned himself to keep whatever negativity that gets hurled his way from truly bothering him. But one would be wrong. UPDATE: Martin has since taken down his Twitter altogether. Of course he did.